Joe Marler's decision to retire from England duty, announced today, is as brave as it is unexpected. It seems that Marler has simply had enough of the international rugby treadmill and his desire to spend more time with his wife and children appears to have held sway over his World Cup ambitions. 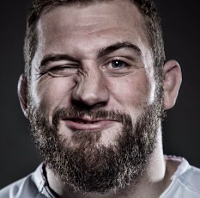 Twenty-eight is no age at all for a loose-head prop to retire and there's little doubt that England will miss his 58 caps-worth of experience in Japan next year. I've always liked Marler - despite his occasional tendency for on-field wazzock-like behaviour - and the international scene will certainly be a less colourful place without him. And the fact that a second twenty-eight year old England international prop (after Alex Corbisiero in 2016) has decided that he can no longer carry on playing the game at the highest level should begin to ring alarm bells among the powers that be that elite players can only be pushed so far.